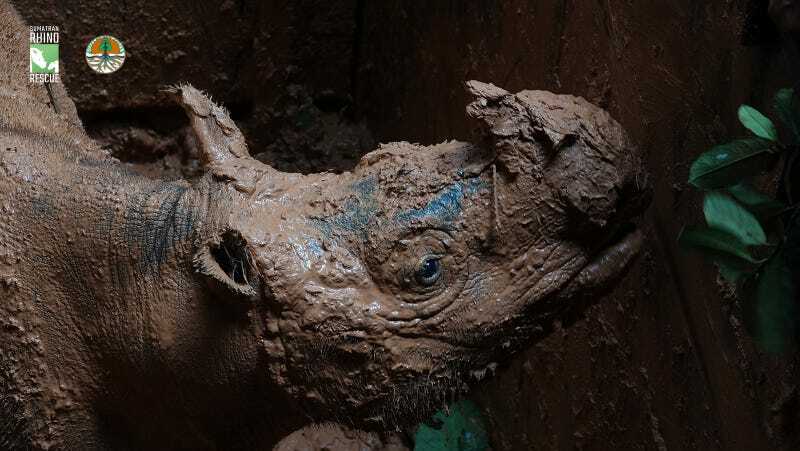 This rescue of the rhino from a mining concession was the first successful mission as part of the Sumatran Rhino Rescue Project, a partnership between the Indonesian government and nonprofits to capture every single one left in the wild. Sumatran rhinos to facilitate breeding that will prevent the species from going extinct. An international team of scientists based in Indonesia set a trap for the animal, dubbed Pahu, back in April. On Sunday, the critically endangered rhino—one of some 80 believed to be left in the wild—fell into the camouflaged pit trap and onto a soft pile of leaves and dirt. From there, she went up a ramp, into a crate, and on her way to a sanctuary in Kalimantan on the island of Borneo joined by an entire entourage of police and even a bulldozer to help smoothen the road (and ride!) before her. Pahu is now the tenth Sumatran rhino in captivity. She’s the first to be captured as part of this program, but other wild Sumatran rhinos have been captured previously. The hope is to rescue more Sumatran rhinos over the coming months to get them to mate. Breeding in captivity has been successful in the past for this species—once in 2012 and again in 2016. Taking them out of the wild to bone might raise concerns to some, but the animals face incredible risk from poaching and habitat loss in the dense forests of Indonesia. Look at her little nose! Just as researchers put out a pit trap for Pahu, poachers can do the same. These rhinos are hunted for their horns, a practice in the region that apparently dates back more than 700,000 years. The Sumatran rhino is the only one in Asia with two horns, which are used in traditional medicine through the region. Luckily for these animals, they’re not kept in cages or crappy concrete enclosures. In their sanctuaries, they roam parts of nearby forests—like the Way Kambas National Park in Sumatra and the Kelian Protected Forest, where Pahu is currently—enjoying their mud wallows and native plants. The team of researchers do all they can to make the animals comfortable and stress-free. This is key to their health, after all. The project isn’t operating on any strict timeline, Sieffert said. The main focus right now is to capture as many rhinos as possible. Four more traps are hidden within the forest where Pahu was found. Camera traps are monitoring the Sumatran rhinos there, but the team doesn’t believe more than 10 rest among its dense trees. These rhinos need saving—and so do the rest of their relatives throughout Asia and Africa. The most endangered rhino, the Javan, has suffered considerably from poaching, too. Conservationists recently captured footage of one rolling around in the mud, and these rare sightings are special. Rhinos like the sumatran and Javan are elusive creatures that are seen in the wild only rarely these days. If this program succeeds, perhaps our kids’ kids will see better odds.